Home broadband adoption stood at 63% of adult Americans as of April 2009, up from 55% in May, 2008. The latest findings of the Pew Research Center’s Internet & American Life Project mark a departure from the stagnation in home high-speed adoption rates that had prevailed from December, 2007 through December, 2008. During that period, Project surveys found that home broadband penetration remained in a narrow range between 54% and 57%. Respondents living in households whose annual household income is $20,000 or less, saw broadband adoption grow from 25% in 2008 to 35% in 2009. Respondents living in households whose annual incomes are between $20,000 and $30,000 annually experienced a growth in broadband penetration from 42% to 53%. In 2009, 46% of African Americans had broadband at home. This compares with 43% in 2008. In 2007, 40% of African Americans had broadband at home. Broadband adoption appears to have been largely immune to the effects of the current economic recession. In the April survey, more than twice as many respondents said they had cut back or cancelled a cell phone plan or cable TV service than said the same about their internet service. 9% of internet users (7% of all adults) say that in the past 12 months they have cancelled or cut back online service. 22% of cell phone users (19% of all adults) report that in the past 12 months they have cancelled or cut back cell phone service. Given that the Project’s April 2009 survey shows that 85% of adults have cell phone service, up from 77% at the end of 2007 (in a sample that also included respondents interviewed on cell phones), it seems likely that cell phone users were economizing on service plans rather than foregoing service altogether. Prices for home broadband service increased from 2008 to 2009. Home high-speed users who reported more choices of providers paid less than others. The average monthly bill for broadband service in April 2009 was $39, an increase from $34.50 in May 2008. Broadband users who say they have just one provider where they live (21% of home high-speed users) report an average monthly bill of $44.70. A growing share of broadband subscribers is paying for premium service that gives them faster speeds. They are also paying more for the extra speed than they did a year ago. In 2009, 34% of home broadband users said they subscribed to a service that gave them faster access speeds, an increase from 29% in 2008. About the same share of home broadband users subscribed to basic service in 2009 (53%) and in 2008 (54%). Subscribers to premium service paid an average of $44.60 per month for broadband in 2009, up from $38.10 in 2008. For basic service, broadband users reported a monthly bill of $37.10 in 2009, up from $32.80 in 2008. A majority of home broadband users see a home high-speed connection as “very important” to at least one dimension of their lives and community, such as communicating with health care providers and government officials, or gathering and sharing information about the community. 68% of home broadband users said such a connection is “very important” (31%) or “somewhat important (37%) for finding out what is going on in their community. 65% of home broadband users said such a connection is “very important” (34%) or “somewhat important (31%) for communicating with health care or medical providers. 62% of home broadband users said such a connection is “very important” (26%) or “somewhat important (36%) for contributing to economic growth in their community. 58% of home broadband users said such a connection is “very important” (23%) or “somewhat important (35%) for sharing their views with others about key issues. 57% of home broadband users said such a connection is “very important” (26%) or “somewhat important (31%) for finding out what is going on in their community. Overall, 55% of broadband users view a high-speed link at home as “very important” with respect to at least one of these topics they were asked about. Some 84% of home broadband users see their fast connection as “somewhat important” or “very important” in at least one of the five realms listed above. 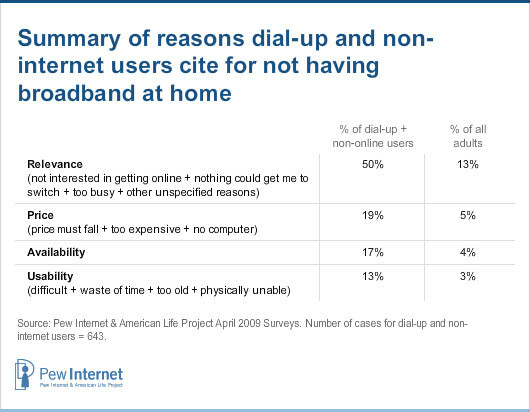 When asked why they do not have the internet or broadband at home, non-users (either dialup subscribers or non-internet users) cite factors related to the internet’s relevance, availability, usability, and price. A third of dial-up users cite price as a barrier, with the remaining two-thirds citing other factors. Only 7% of Americans are dial-up internet users at home, a figure that is half the level it had been two years ago. Here’s what they say when asked what it would take for them to switch to a broadband connection at home. 32% said the price would have to fall. 20% said nothing would get them to change. 17% said it would have to become available where they live. 13% cited some other reason. 22% say they are not interested in getting online (a decrease from 33% who said this at the end of 2007). 16% say they can’t get access where they live. 10% said it was too expensive. 7% said they believe the internet is difficult to use. 6% say they don’t need or want it. 6% responded “don’t know” or refused to respond. 5% said they don’t have a computer. 4% said they were busy or have no time for the internet. 4% said they think the internet is a waste of time. Consolidating the reasons mentioned across the two classes of non-broadband users into four categories yields the following table. It shows that half of non-internet or dial-up users cite a reason that suggests they question the relevance of connecting to the internet – either at all or with high-speed at home.